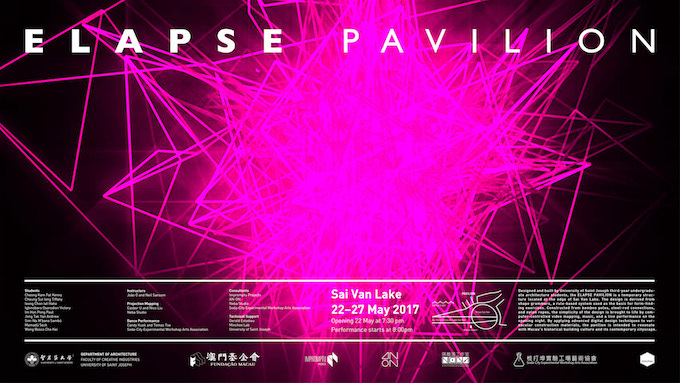 Designed and built by University of Saint Joseph third-year undergraduate architecture students, the ELAPSE Pavilion is a temporary structure located at the edge of Sai Van Lake. The design is derived from shape grammars, a rule-based system used as the basis for form-finding exercises. Constructed from bamboo poles, steel-rod connections, and nylon ropes, the simplicity of the design is brought to life by computer-controlled video mapping, music, and a live performance on the opening night. By applying advanced digital design techniques to vernacular construction materials, the pavilion is intended to resonate with Macau’s historical building culture and its contemporary cityscape.